We’re delighted to have worked with some truly fantastic hotels and guest houses over the years, and it’s time to recognise their efforts. 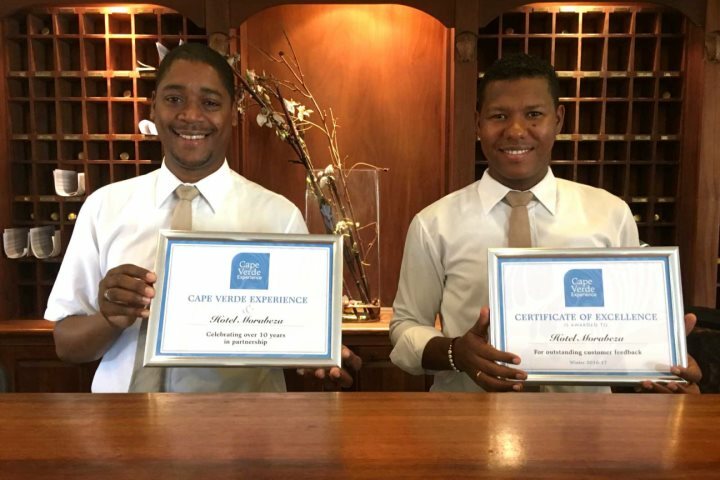 Here at Cape Verde Experience, we’re thrilled to have entered our 11th year of operations, providing package and tailormade holidays across the archipelago. During this time, not only have we expanded our property collection on some of Cape Verde’s most popular islands, but we’ve also looked further afield to the lesser-known islands, and now offer the choice of seven of the ten that make up the archipelago. As an operator, we’ve always had customer service at the very heart of everything we do, and it’s also been a leading principle of all the properties we’ve introduced into our portfolio. We were delighted to provide certificates of excellence to some of our properties for their outstanding customer feedback. Evidence for these awards was gathered from Feefo, the leading independent review company, and our own personal holiday questionnaires. 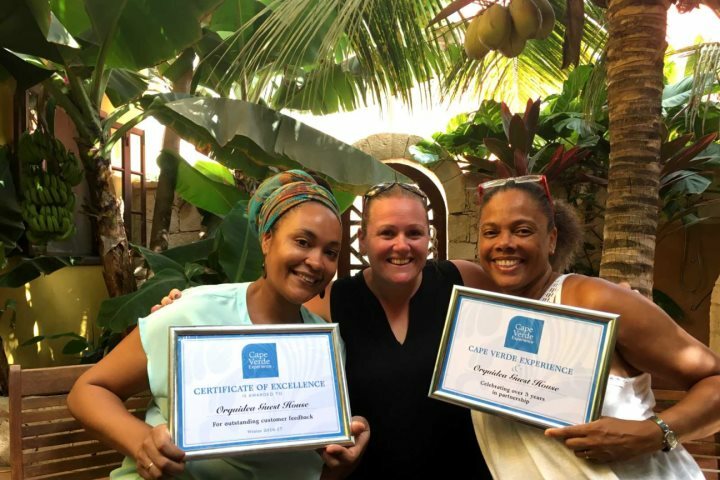 Among these awards were Hotel Morabeza on Sal,​ Orquidea Guest House on Boa Vista, Pestana Tropico Hotel on Santiago, Kira’s Hotel on São Vicente, all of which were thrilled to receive their certificates back in October. 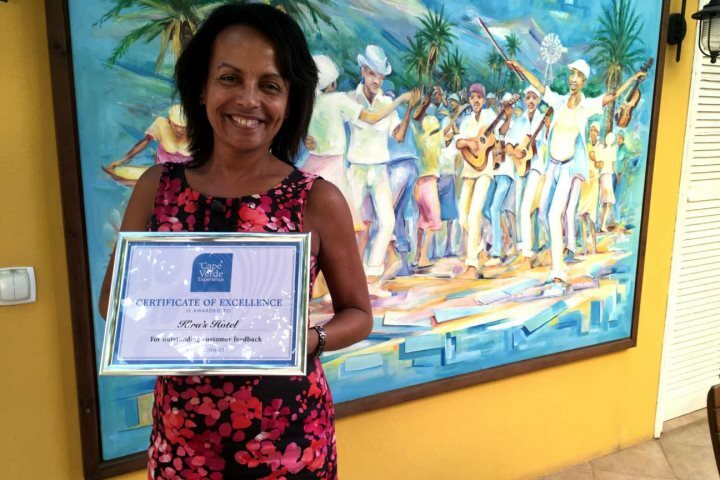 Above: Owner and manager of Kira's Hotel, Isabel, receiving their outstanding customer feedback award. Following on with the same customer service theme, several of our hotels also achieved excellent customer feedback, which we felt also deserved recognition. Also sourced using Feefo and holiday questionnaires, we were pleased to present Oasis Porto Grande Hotel on São Vicente, Iberostar Club Boa Vista on Boa Vista, Odjo d’Agua Hotel on Sal and Colonial Guest House on Fogo with their certificates. On a slightly different note, we were also pleased to present Dunas de Sal Hotel on Sal island an award for the Best Hotel Restaurant for their popular Salt & Pepper Restaurant. We are thrilled to have established some wonderful working relationships with all our hotels, and were delighted to present a variety of anniversary awards, many of which has worked with us from the very beginning - celebrating 10 years together. These were designed to show our appreciation of our hotels’ continued support, and to congratulate them on length of service. Both five and 10-year certificates were among those presented, which included some of our customer favourite hotels, such as Hotel Morabeza, Hotel Pontão, Odjo d’Agua Hotel and Dunas de Sal Hotel, all celebrating 10 years, and all based on the island of Sal. Celebrating five years is Orquidea Guest House, on the island of Boa Vista. Above: Long-standing staff members of Hotel Morabeza, Erido and Euclides receiving their anniversary award. Above: Jenny (left) and Orquidea (right, and owner and manager) at Orquidea Guest House receiving their anniversary award, presented by product manager Charlotte (centre). We hope that these awards are informative for our customers, and that they’re helpful when it comes to choosing your perfect accommodation. We also believe these awards are a fantastic encouragement for all our hotels, so that they each continue to go above and beyond when it comes to their customer service. If you want to find out more about a holiday to Cape Verde, visit our Holiday Ideas page for some inspiration, or give our experts a call on 01489 866969.